More has been written about Maximilian E. Hoffman than his Frank Lloyd Wright designed showroom. Born in Austria in 1904, it is safe to say that he was as visionary in the automobile industry as Wright was in Architecture. Alfa Romeo, BMW, Jaguar, Mercedes-Benz, Porsche and Volkswagen. Hoffman was instrumental in making these brands household names. Can you say "Grandfather of the imported sports car." In the late 1930s he moved to Paris, then settled in New York soon after the start of World War II. He began a jewelry business that was successful enough to propel him into the auto industry. He formed the Hoffman Motor Car Company in 1947, and as legend has it, his showroom opened with a single French Delahaye four passenger coupe. An article in the June, 1947 Road & Track, announced the opening of his showroom. By 1949, the list of automobiles he imported read like a who's who of automobiles: Jaguar, Rolls-Royce, Bentley, Austin, Cooper, Rover, Lea Francis and Morgan. Volkswagen was struggling to find an interest in their Beetle until Max Hoffman took the risk, signing up to be the eastern US distributer and arranging for the first public showing in the United States. In 1950 he met with Ferdinand Porsche at the Paris Motor Show and imported 15 Porsches. He also added the Jowett. In 1951 he purchased the Glockler-Porsche No. 2, racing it in Palm Beach Florida in December 1951. He gained notariety with headlines like "The most outstanding performance was put in by Max Hoffman, driving a Porsche." In 1952 he successfully participated in Florida and Bridgehampton races, sparking America's love affair with the Porsche. 1952 headlines read, "M.E. Hoffman Victorious in 1 Hr. Race Driving 'Glockler' Porsche!" 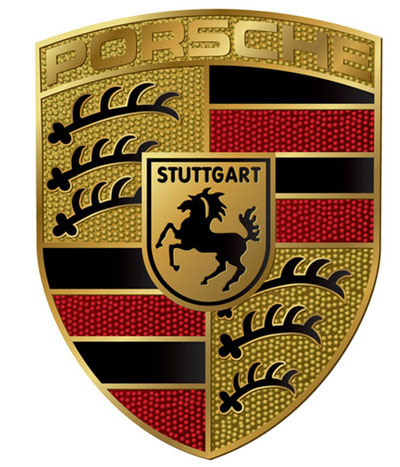 According to Porsche and legend, Max Hoffman felt Porsche deserved an emblem for his imported cars. He met over lunch in New York with Ferry Porsche, who sketched it on a restaurant napkin. It first appeared on steering wheel hubs in 1953. By 1952, U.S. sales accounted for 21 percents of Porsche's sales. He was the first to import the Mercedes-Benz in 1952, and was instrumental in creating the 300SL sports car. 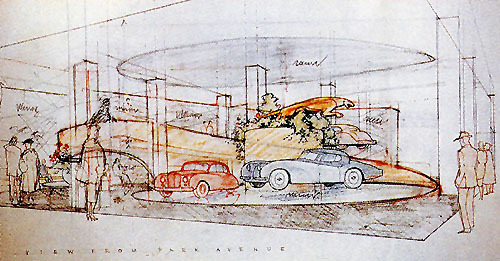 In 1953, Hoffman contacted Wright about designing a new showroom to display Jaguars. After a few delays, Hoffman finally opens his newly designed Frank Lloyd Wright showroom in 1955, three blocks to the Southwest at 443 Park Avenue. The July 1955 issue of Architectural Forum ran a two page spread on the new Showroom. was organized to succeed to the business of seven corporations which had been organized by Hoffman at varying times commencing in 1947." Besides New York City and Beverly Hills, California, he was involved with more than 475 sub-distributors and dealers located in over 370 cities and towns throughout the United States. In the mid 1960s, he sold his other distributorships and focused his attention on BMW, again impacting the design of the BMW 2002 and dominating BMW sales. In 1975 Max Hoffman sold his interest to BMW and retired. Unquestionable was Max Hoffman's single-handed impact on the automobile industry. He was the driving force behind the success of many brands imported into the United States. The Hoffman Display Room featured a revolving display turntable on which three to four cars could be displayed. The ramp rose from the back and wrapped around the left side leading to a cantilevered balcony. The ramp allowed for additional displays as well as viewing cars from the balcony. 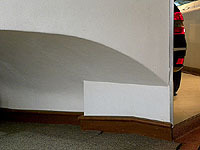 The Hoffman display room was a precursor to the Guggenheim Museum, a seamless, continuous spiral ramp. Wright's initial designs for the Guggenheim dated to 1943. The Hoffman display room opened in 1954. Five years later and thirty-two blocks Northeast, the Guggenheim Museum finally opened. 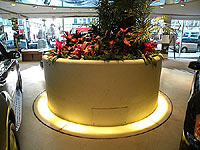 Centered in the display turntable was a circular planting box. Wright featured a large sculpture of the Jaguar hood ornament, but in 1953, when Hoffman began importing Mercedes-Benz, Jaguar opened their own showroom. Although designed as a Jaguar Showroom, it was never used as such. There were other Wright designed elements. Planting boxes, built-in seating, furniture, imbedded lighting and a cantilevered balcony. 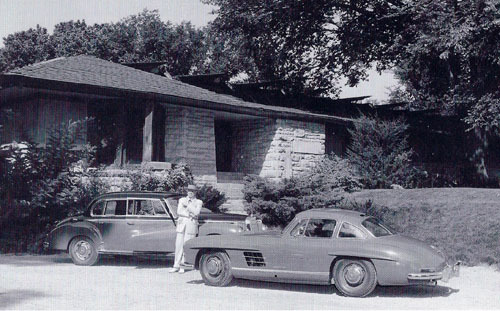 Wright received two Mercedes from Max Hoffman as part of his commission for designing the Hoffman showroom. In 1982 the display room was remodeled and a mirrored Mercedes three-pointed star was added to the ceiling over the turntable. Oversight of the renovations was supervised by Taliesen Architects Wes Peters, Cornelia Brierly, and Morton Delson. In 2002 the display room was expanded and completely renovated. In 2008, Mercedes-Benz announced that it would be investing over $30 million in a new and larger company-owned flagship dealership in Manhattan. The historic Frank Lloyd Wright sales showroom at 430 Park Avenue would remain unchanged in design and operations. Would you destroy a Rembrandt? Frank Lloyd Wright's landmark Hoffman Showroom demolished March 2013. Courtesy Matt Chaban, Crain's New York Business. April 12, 2013. Wright�s New York Showroom, Now Just a Memory. By Phil Patton, New York Times, June 21, 1913. 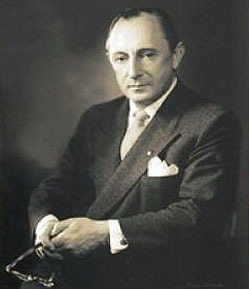 Max Hoffman formed the Hoffman Motor Car Company in 1947, with a showroom on Park Avenue. As legend has it, and he was, the showroom opened with a single French Delahaye four passenger coupe. 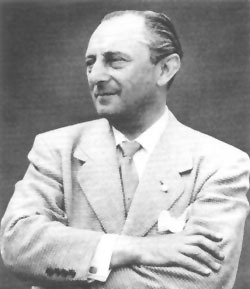 According to the extensive article in the June, 1947 Road & Track, with "twenty-five years in the sales of European automobiles" he was "formerly the Viennese representative for Rolls-Royce, Bentley, Alfa-Romeo, Delahaye and other Continental manufacturers." As a self-promoter, he may have stretched the truth a bit, since he was born in Austria in 1904, and moved to Paris in the late 1930s, then settled in New York soon after the start of World War II. Although Hoffman started with a single Delahaye in 1947, he was also the sole distributor for Alfa-Romeo, Lancia, Daimler, Allard, Lanchester, Hotchkiss and H.R.G. Hoffman continued to develop relationships with other manufacturers. By 1949 he was also representing Jaguar, Rolls-Royce, Bentley, Austin, Cooper, Rover, Lea Francis and Morgan. Volkswagen was struggling to find an interest in their Beetle until Max Hoffman took the risk, signed up to be the eastern US distributer and arranged for the first public showing in the United States. 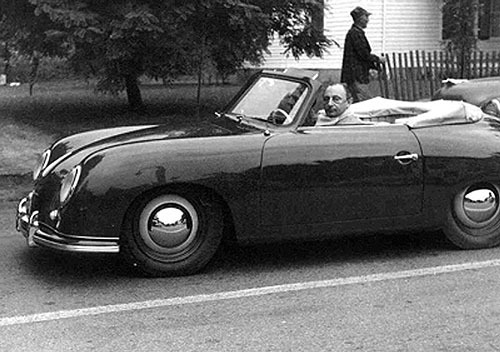 In 1950 he met with Ferdinand Porsche at the Paris Motor Show and imported 15 Porsches. He also added the Jowett. Like Wright, Hoffman knew how to promote himself and his product. In 1950 he met with Ferdinand Porsche at the Paris Motor Show and imported 15 Porsches. Hoffman understood that racing was an exceptional way to advertise his business. On May 12, 1951 he raced a 1951 Porsche in the Giants' Despair Hill Climb, Wilkes-Barre, PA. This may be the first recorded race Hoffman entered after immigrating to the U.S. He also imported the British Jowett Jupiter and Javelin. On September 15, 1951 he entered a Jowett Juniper in the Grand Prix of Watkins Glen, New York. His driver, George Weaver, successfully placed First in Class and First Overall in the 10 lap 66 mile Queen Catharine Cup. On October 28, 1951, Hoffman entered the Mt. Equinox Hillclimb, Manchester, Vermont. At 46, he placed first in Class 6. It was reported that "The most outstanding performance was put in by Max Hoffman, driving a Porsche." In 1950 Hoffman met with Ferdinand Porsche at the Paris Motor Show and the first 15 Porsche 356 models were shipped to Max Hoffman in the autumn of 1950. 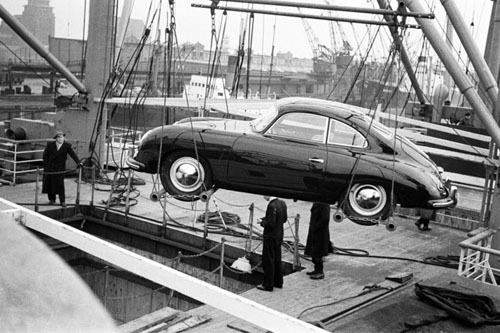 Ferry Porsche and his son Ferdinand Alexander watch a Porsche 356 Coupe is being unloaded in New York. The third person could possible be Max Hoffman. Photograph courtesy of Porsche, circa 1950-1953. 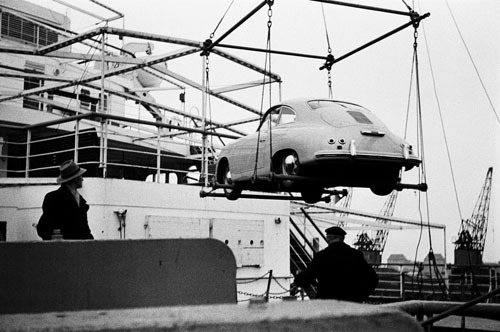 Ferry or Ferdinand (on the left) watches as a Porsche 356 Coupe is being unloaded in New York. Photograph courtesy of Porsche, circa 1950-1953. 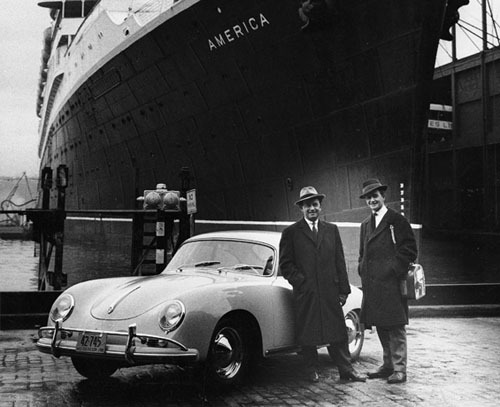 Ferry Porsche and his son Ferdinand Alexander dockside in New York, standing along side one of the Porsche 356 Coupes just unloaded. Photograph courtesy of Porsche, circa 1950-1953. 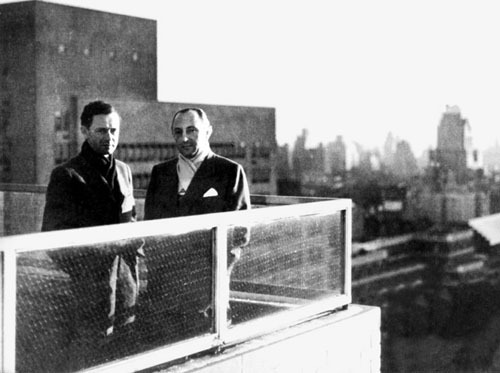 Ferry Porsche and Max Hoffman rooftop in New York. Photograph courtesy of Porsche, circa 1950-1953. According to Porsche and legend, in 1952 Max Hoffman felt Porsche deserved an emblem for his imported cars. He met over lunch in New York with Ferry Porsche, who sketched it on a restaurant napkin. It first appeared on steering wheel hubs in 1953. Hoffman Display Room for the Jaguar. View from Park Avenue. 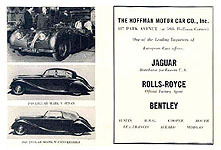 Hoffman began importing Jaguars in 1948, and selected Wright to design the interior of the showroom. It featured a revolving display on which three to four cars could be displayed. The ramp rose from the back and wrapped around the left side. The ramp allowed for additional displays as well as viewing cars from above. In 1953, when Hoffman began importing Mercedes-Benz, Jaguar opened their own showroom. Although designed as a Jaguar Showroom, it was never used as such. Courtesy of the Frank Lloyd Wright Foundation. 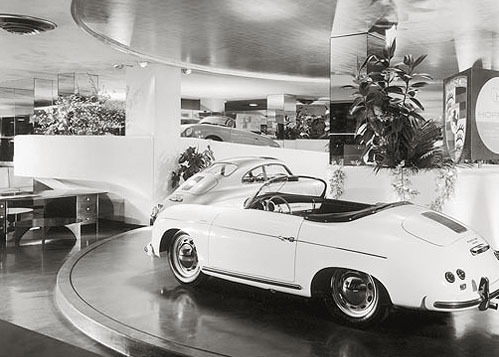 When the showroom opened in 1955, Hoffman displayed Porsches and his other cars. The showroom featured a revolving display on which three to four cars could be displayed. The ramp rose from the back and wrapped around the left side. The ramp allowed for additional displays as well as viewing cars from above. 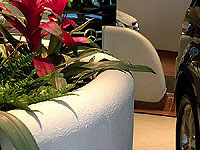 The Hoffman inspired Porsche emblem sits atop the circular planter. Photographed by Ezra Stoller. Detail of the Hoffman Display Room for the Jaguar, viewed from Park Avenue. 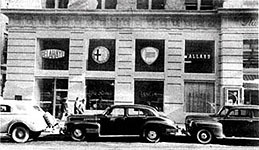 Detail of the Hoffman showroom in 1955. The showroom featured a revolving display on which three to four cars could be displayed. The ramp allowed for additional displays as well as viewing cars from above. Photographed by Ezra Stoller. 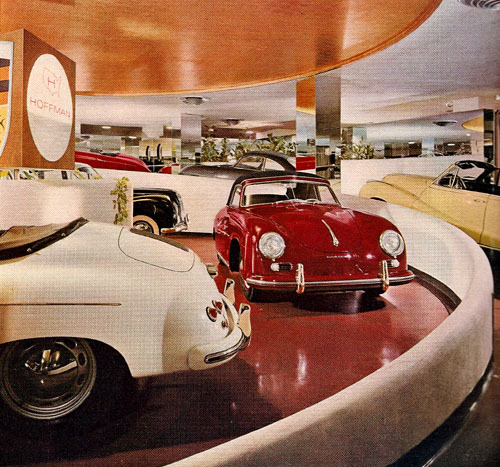 Detail of the Hoffman showroom in 1955. The ramp rose from the back and wrapped around the left side of the Display Turntable, leading to the Balcony on the left. The ramp allowed for additional displays as well as viewing cars from above. Photographed by Ezra Stoller. Courtesy of Architectural Forum. Hoffman Display Room for the Jaguar. Cross section. Courtesy of the Frank Lloyd Wright Foundation. Detail of the Hoffman Display Room cross section. The showroom featured a revolving display on which three to four cars could be displayed. The ramp rose from the back and wrapped around the left side. The ramp allowed for additional displays as well as viewing cars from above. Max Hoffman driving one of his Porsche 356, mid 1950s. Photo by Frank Shaffer. Wright received two Mercedes from Max Hoffman as part of his commission for designing the Hoffman showroom. Photographed by... circa 1956. The Hoffman Display Room for the Jaguar. 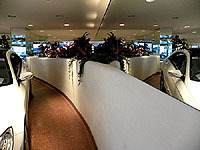 Hoffman began importing Jaguars in 1948, and selected Wright to design the interior of the display room. It featured a revolving display turntable on which three to four cars could be displayed. The ramp rose from the back and wrapped around the left side leading to a balcony. The ramp allowed for additional displays as well as viewing cars from the balcony. The Hoffman display room was a precursor to the Guggenheim Museum, a seamless, continuous spiral ramp. Wright's initial designs for the Guggenheim dated to 1943. The Hoffman display room opened in 1954. Five years later and thirty-two blocks Northeast, the Guggenheim Museum finally opened. Centered in the display turntable was a circular planting box. Wright featured a large sculpture of the Jaguar hood ornament, but in 1953, when Hoffman began importing Mercedes-Benz, Jaguar opened their own showroom. Although designed as a Jaguar Showroom, it was never used as such, and according to Storrer, the sculpture of the leaping Jaguar was returned to England. There were other Wright designed elements. Planting boxes, built-in seating, furniture and a cantilevered balcony. In 1982 the display room was enlarged, remodeled and a mirrored Mercedes three-pointed star was added to the ceiling over the turntable. Oversight of the renovations was supervised by Wes Peters, Cornelia Brierly, and Morton Delson. Floor plan illustrated by Douglas M. Steiner, Copyright 2010. Background blueprint courtesy of the Frank Lloyd Wright Foundation. 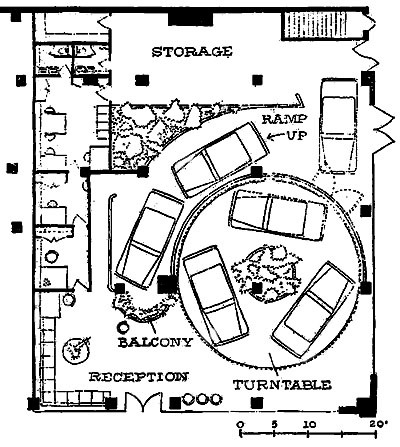 Floor plan July 1955. Courtesy of Architectural Forum. 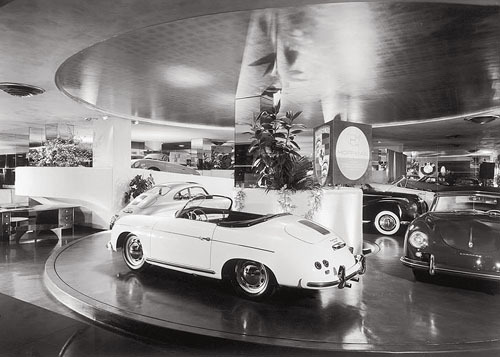 The Hoffman Display Room featured a revolving display turntable on which three to four cars could be displayed. The ramp rose from the back and wrapped around the left side leading to a cantilevered balcony. The ramp allowed for additional displays as well as viewing cars from the balcony. 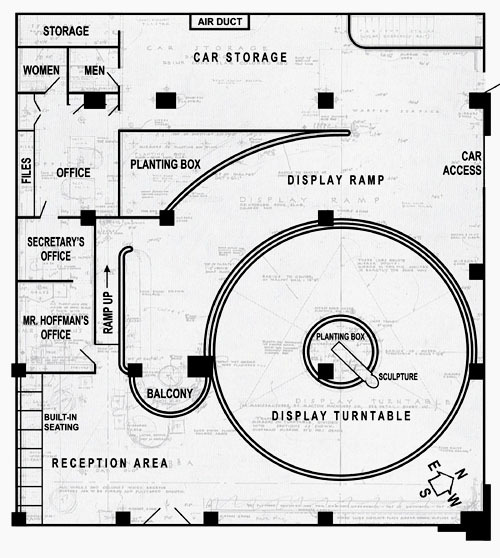 The Hoffman display room was a precursor to the Guggenheim Museum, a seamless, continuous spiral ramp. Centered in the display turntable was a circular planting box. Wright featured a large sculpture of the Jaguar hood ornament. There were other Wright designed elements. Planting boxes, built-in seating, furniture, imbedded lighting and a cantilevered balcony. "Europe on Park Avenue", June 1947, Road & Track, Pp 8-9. "Bridgehampton Road Race", August 1952, Road & Track. "Frank Lloyd Wright designs a small commercial showroom", July 1955, Architectural Forum, Pp 132-133. "Hoffman Motors Files For Secondary", March 10, 1959, SEC, Pp 2-3. "The Baron of Park Avenue", 2nd Quarter, 1972, Automobile Quarterly, Pp 152-167. "Frank Lloyd Wright Revisited - Redecorating Hoffman House", Architectural Digest - January-February 1976, Pp 35-39. "Architectural Digest: American Interiors", Rense, 1978, Pp 198-205. "World�s most distinguished showroom? ", Mercedes - Volume V, 1982, P 4. Edited and Photographed: Futagawa, Yukio, 1990, Pp 290. "The Frank Lloyd Wright Companion", Storrer, 1993, P 427. 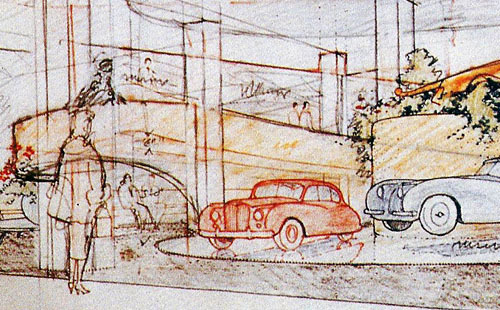 "Frank Lloyd Wright's Automobiles", Frank Lloyd Wright Quarterly - Spring 1997. "The Showroom That Frank Lloyd Wright Built", June 1997, Road & Track, Pp 194, 197, 199. "Frank Lloyd Wright - A Visual Encyclopedia" Thomson, 1999, Pp 150-151. "Wright Sites: A guide to Frank Lloyd Wright Public Places", Sanderson, 2001, P 88. "Frank Lloyd Wright in New York. The Plaza Years, 1954-1959", Hession; Pickrel, 2007, Pp 50-54. "Mercedes-Benz To Invest More Than $30 Million In New Flagship Dealer In Manhattan", November 19, 2008. "Frank Lloyd Wright, Complete Works 1943-1959", Pfeiffer; Gossel, 2009, Pp 368, 369-370, 404.